If you are serious about expanding your business, you might look at buying a VA business to expand rapidly. These deals can be an excellent way of expanding your client list, owning a ready-made business, and a shortcut to SEO supremacy… But they can also be extremely duff deals! 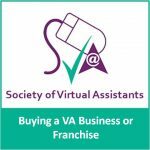 So whether you are buying a virtual assistant franchise or buying out an individual VA, we’ve got everything you need to know. (i.e. the value of the customers and company reputation). In a virtual assistant business, the bricks and mortar does not exist, the stock is the owner’s time, and the goodwill is somewhat difficult to assess as projects are often short term. Buying a virtual assistant franchise is in fact a whole new genre of business valuation….and there are more than a few people hoping to take advantage of that! We put together a guide of what questions to ask the seller, and the sorts of things you have to consider before buying a VA business or a Virtual Assistant Franchise. Please note that if the business is claiming to be a franchise, they should be registered with The British Franchise Association. At present there are no virtual assistant businesses registered with them on full membership criteria. Download our full guide to buying a VA Business here. Or got a business to sell? We’re happy to provide an anonymous advert for you to gather the information you need before selling it. Email for further details in complete confidentiality.